Join our Code Jam Hub! 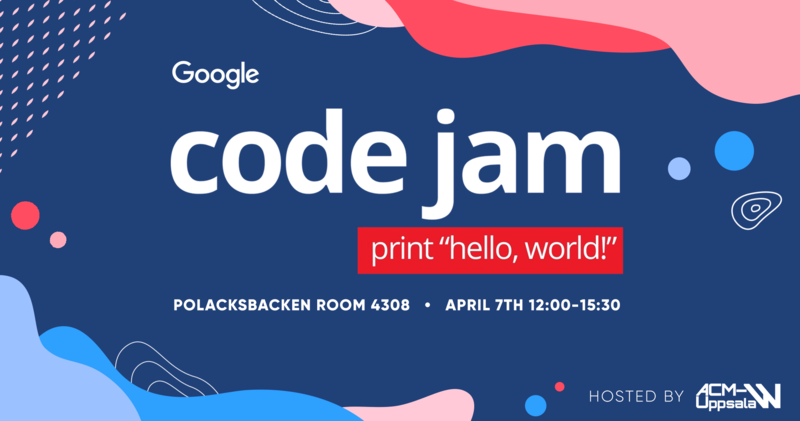 UU ACM-W will be hosting a hub for the Qualification Round of Code Jam, a world-wide programming competition that involves solving a number of algorithmic puzzles. The Qualification Round runs over 27 hours (6thApril 0:00 – 8th April 3:00 CET) to allow people from different times zones to participate. Within this time span, our hub will take place on 7th April 12:00-15:30 at the Informationsteknologiskt centrum (ITC), room 4308. Of course it is also possible to work on the exercises outside of the hub if participants feel that they require more time. Everyone is welcome to take part in the hub and we particularly encourage women and everyone with little or no hackathon experience to join. We aim to provide a friendly environment to make it an interesting and fun learning experience for all and will serve free pizza. Exercises from previous Code Jam contest can be found here. The winner of the World Finals in Toronto, Canada will earn the title of Code Jam Champion and $15,000.